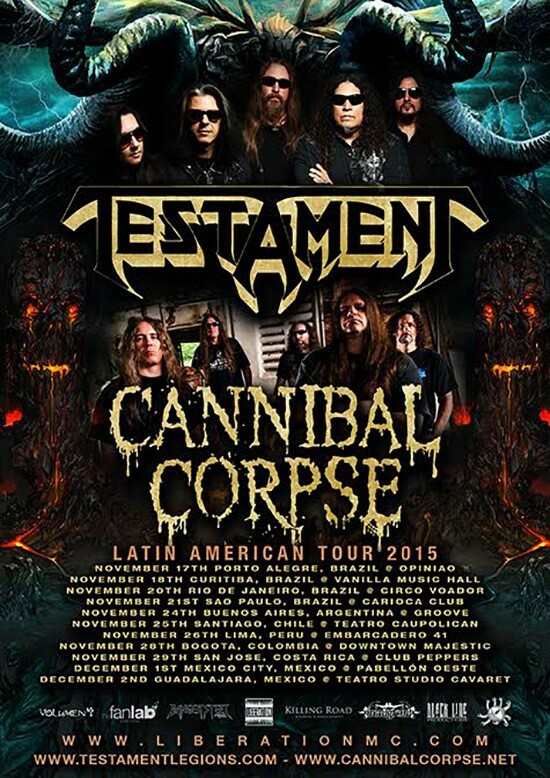 CANNIBAL CORPSE confirms Latin American tour with Testament! Cannibal Corpse have confirmed that they will be touring Latin America in November and December with thrash legends, Testament! The tour begins November 17th in Brazil, and concludes on December 2nd in Guadalajara, Mexico. The combined weight of these two bands will surely mean these shows will sell fast. Tickets go on sale Wednesday, June 10 at 10am ET at liberationmc.com/tours! A Skeletal Domain, the latest full-length from American death metal icons, Cannibal Corpse, debuted at an astounding #32 on Billboard’s Top 200 chart, making it the highest charting record in the band’s storied history! This is the band’s thirteenth full-length album. It was produced by Mark Lewis (The Black Dahlia Murder, DevilDriver) at Audio Hammer Studios in Flordia. The record boasts twelve ravenous tracks of confrontational, meticulously-executed ill-omened brutality as only Cannibal Corpse can deliver.